Forgetting to flush the toilet can lead to arguments at home, but can also apparently cause larger altercations in public. Recently, a man onboard a Virgin America flight failed to flush, and is now suing for the consequences. 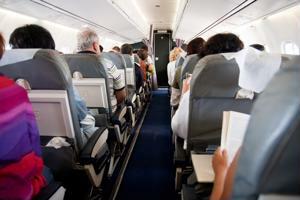 According to Global Travel Industry News, Salvatore Bevivino, a businessman from San Francisco, caused an uproar after he left the airplane's toilet unflushed. The man, traveling home from Philadelphia at the end of April, used the plane's lavatory in the middle of his flight and left the compartment without pressing the flush button. Bevivino exited the bathroom with a smile on his face, according to the source. A little while later, a flight attendant walked by the open door of the restroom and noticed the oversight. This may have been an innocent mistake, but for Bevivino - who had already made a scene on the plane - the incident had serious repercussions. RT TV, an online news source, explained that the toilet incident topped off Bevivino's overall behavior on board. Before he went to use the plane's facilities, Bevivino already had gotten on the flight staff's bad side. According to the source, the 52-year-old became upset when he tried to get a drink. Rather than using the touch screen at his seat to place his order, Bevivino asked a flight attendant for a soda the old-fashioned way. The crew member explained that the passenger had to use the touch-screen to get his soft drink. After asking two other attendants for his soda, Bevivino refused to follow the plane's beverage-ordering protocol, and went without refreshment. According to the captain, Bevivino yelled obscenities during his confrontations with the flight staff. When the plane landed, a group of FBI and TSA officers removed Bevivino from the plane, but first the captain questioned Bevivino about his behavior. After denying any wrongdoing, Bevivino was asked why he didn't flush the toilet after he used it. The mention of the unflushed toilet upset Bevivino to the point of taking legal action. He filed a $500,000 lawsuit against the airline because he felt embarrassed after the captain revealed his lavatory error. Bevivino's behavior leading up to toilet episode may have warranted the use of authorities, but to him, having been cited for forgetting to flush may tarnish his professional reputation.